Flordemayo is a Curandera Espiritu, or a healer of divine spirit. As a seer, she has the ability to see other realms of color, light, and sound. In addition, has the ability to see the effects of existing imbalances on the physical, emotional and spiritual realms within a person’s energy system. She was born in highlands of Central America, specifically Nicaguara and was the youngest of 15 children. She was born under the sign for the seed, in Mayan astrology. As a world traveler she has offered ceremonies and has spoken on a wide range of topics from healing with the use of herbs to her more recent project, The Seed Temple, located in Estancia, New Mexico. 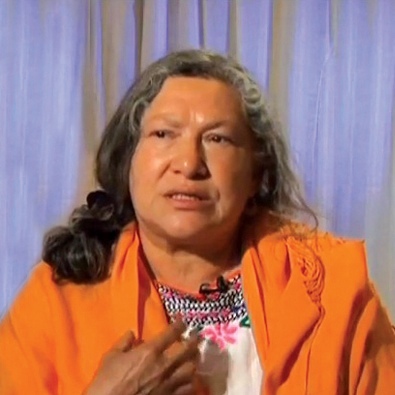 Since 2004, Flordemayo has been one of the founding members of the International Council of Thirteen Indigenous Grandmothers, a prestigious group of traditional female elders drawn from around the world, who represent a global alliance of prayer, education, and healing for our Mother Earth, all of her inhabitants, all the children, and for the next seven generations to come. Being born under the sign of the seed, Flordemayo sees her role as cosmic germinator through teaching, community, manifestation and development. In recent years, Flordemayo has been working with seeds. Specifically, she sees her role as a caretaker of seeds through prayer. In 2012, Flordemayo received a vision during dialogue with the Beloved Mother. In the vision, Flordemayo finds herself sitting in a rocking chair, rocking back and forth, and being guided to prepare seed bundles with prayer. The seed bundles are to be given to the parents of children being born today and those yet to be born in the future.